Shymkent (Kazakh: Шымкент, translit. Shymkent, شىمكەنت, known until 1993 as Chimkent; Uzbek: Чимкент, چىمكېنت; Russian: Чимкент, translit. 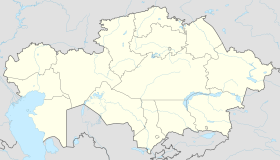 Čimkent), is a city in the Republic of Kazakhstan; one of three cities which have the status equal to that of a region (the city of republican significance). It is the third most populous city in Kazakhstan behind Almaty and Astana with an estimated population of 1,002,291 as of 1 June 2018. According to regional and city officials, the millionth resident of Shymkent was born on 17 May 2018. Shymkent is a major railroad junction on the Turkestan-Siberia Railway. The city is also a notable cultural centre, with an international airport. Shymkent is situated 690 kilometres (430 mi) west of Almaty and 120 kilometres (75 mi) to the north of Tashkent, Uzbekistan. The name Chimkent comes from two Sogdian words, chim meaning 'turf' and kent (or kand) meaning 'city'; thus "city in the grass/turf." After Kazakhstan gained independence, the city was renamed Shymkent in 1993 as part of the government’s campaign to apply Kazakh names to cities. The formal spelling of Шымкент (Shymkent) as codified in Kazakhstan’s Constitution goes against the original Uzbek spelling rules of never having the letter "ы" follow the letter "ш". As a result, the new name Шымкент (Shymkent) is used only in Kazakhstan, while other countries continue to use the original spelling Чимкент (Chimkent). Shymkent was founded in the twelfth century as a caravanserai to protect the Silk Road town of Sayram, 10 km to the east. Shymkent grew as a market center for trade between Turkic nomads and the settled Sogdians. It was destroyed several times: by Genghis Khan, soldiers from the southern Khanates, and by nomad attacks. In the early 19th century it became part of the khanate of Kokand. It was captured by the Russians in 1864. It was renamed Chernyaev in 1914 and renamed Shymkent in 1924. Following the Russian conquest, Shymkent was a city of trade between nomadic Turks and sedentary Turks, and was famous for its kumis. There was a gulag located near Shymkent, and many Russian-speaking people came to the area via imprisonment. In January 2015 Shymkent officials sent a request to UNESCO to be recognized as an ancient city. Until 2018, Shymkent was the administrative center of South Kazakhstan Region. On 19 June 2018 it was taken out of South Kazakhstan Region and subordinated directly to the government of Kazakhstan, the administrative center of the region moved to Turkistan, and the region renamed Turkistan Region. Shymkent features a continental mediterranean climate (Köppen Dsa) that borders on a mediterranean climate (Csa), not unlike Eastern Washington or Northern Idaho but with much hotter summers. Shymkent features hot, relatively dry summers and cold winters. Winters here are noticeably warmer than in more northerly cities like Almaty and Astana, with the mean monthly temperature during the city’s coldest month (January) averaging around −1 °C (30.2 °F). Winter snowfalls are common, although rainfall during that season occurs mixed in with that. Shymkent averages just under 600 millimetres (23.62 in) of precipitation annually. The vegetation of the city is known by its extreme diversity. Trees like oak, elm, poplar, cannan maple, willow, chestnut, acacia, ailanthus, thuja, pine, spruce grow in the city. Form horticultural crops cherry, apricot, dried apricot, plum, pomegranate, walnut, quince, grape varieties are widespread. On the north of the city in 1980 "Dendropark" was built. Its area is 150 hectare and there are about half of million trees and shrubs of 1360 different types. Most of them are rare and exotic types. According to a government estimate in 2012, the city had 669,326 inhabitants. In 2009, the population of Shymkent was 603,499 (2009 Census results); in 1999 it was 423,902 (1999 Census results). By the beginning of 2015, Shymkent was joined by the areas of the adjacent districts. In this connection, the city population has increased up to 858,147 people within the new boundaries by the beginning of 2015. By that time, 711,783 people resided in the former area of Shymkent . By the 1st June 2018, the population of Shymkent was 1,002,291. Formerly dominated by lead mining, industrial growth began in the 1930s. A lead smelter was opened in Shymkent in 1934 or 1938. It supplied a major part of the USSR's metals needs, copper as well as lead and others, including three-quarters of all bullets fired by the Red Army. Smelting continued until 2008, causing extreme levels of pollution (lead, cadmium et al.) in the surrounding ground, and then controversially restarted in 2010, briefly, under a major UK-listed company, Kazakhmys. The city also has industries producing refined zinc, processed karakul pelts, textiles, foodstuffs, and pharmaceuticals. Also, the city has a medium-sized refinery, which is owned and operated by PetroKazakhstan. A bicycle-sharing system operates in Shymkent with 40 stations around the city. ^ Chisholm, Hugh, ed. (1911). "Chimkent" . Encyclopædia Britannica. 6 (11th ed.). Cambridge University Press. p. 165. ^ Nurlan Sauranbayev. "Congratulation of Shymkent city akim N. Sauranbayev with the acquisition the city of republican significance". Archived from the original on 2018-06-22. Retrieved 2018-06-22. ^ Shymkent's Akimat. "A millionth resident of Shymkent received an apartment as a gift". Archived from the original on 2018-06-13. ^ "Shymkent Seeks UNESCO Recognition As 2,200-Year-Old City". www.astanatimes.com. ^ "Публичное подписание Указа «О некоторых вопросах административно-территориального устройства Республики Казахстан»" (in Russian). President of Kazakhstan. 19 June 2018. Retrieved 21 June 2018. ^ "Weather and Climate - The Climate of Shymkent" (in Russian). Weather and Climate (Погода и климат). Archived from the original on 25 November 2016. Retrieved 25 November 2016. ^ "List of Localities with Population - Akimat of the South Kazakhstan Region". ontustik.gov.kz. 29 September 2015. ^ "اتفاقية توأمة بين الغردقة وإقليم جنوب كازاخستان لتنشيط السياحة |صور". بوابة الأهرام (in Arabic). Retrieved 2018-07-14. Wikimedia Commons has media related to Shymkent. Wikivoyage has a travel guide for Shymkent.